where (w) is the rate parameter, Ef is the fusion heat release and PB, PS are the bremsstrahlung and synchrotron radiation power losses. n1 and n2 are the particle number densities of the two reactants (see Figure 8.8), in general at different temperatures T1 and T2, respectively. k is the Boltzmann constant. Rate parameters and power losses may be found in [Huba, 2002, pp. 45 and 56-57]. Equation (8.17) is an ignition criterion based on a steady-state ignition power budget: it says essentially that the net rate of fusion energy generation, that is, fusion rate times energy released per fusion event (collision), minus power lost by radiation, must be equal to the kinetic energy absorbed by the reactants. In other words, the kinetic energy of reactants on the right-hand side of equation (8.17) must not only be high enough to support the fusion heat release (first term on the left-hand side), but must also compensate for the radiative heat loss (second term on the left-hand side). 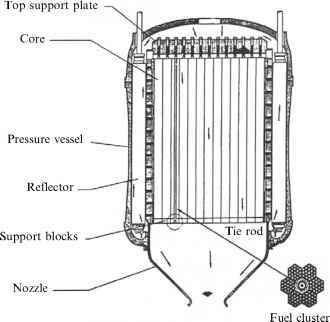 This condition is similar to the condition for flame anchoring, for instance, inside a gas turbine combustor; however, in a combustor the power lost is not radiative but convective, so that the confinement time r is replaced by a fluid dynamic convection or residence time inside the combustor. The Lawson condition (an energy "breakeven" condition) links together temperatures, particle density and confinement time. Meeting this condition in a practical device is hard. Fusion is the power source of stars [Kaufmann, 1993, Chapter 3], and maintaining it artificially in an engine is still to be achieved. In stars it is gravitation that compresses and heats matter until temperatures become high enough to start fusing. In a reactor fuel is cold and gravitational effects are negligible, so it must be brought to ignition temperatures by other means, e.g., by radio-frequency electromagnetic waves heating. So, ignition needs an external power source, and temperatures about 10 times higher than in our Sun. Equation (8.17) shows why: in the energy source term on the right-hand side, if n1 or n2 cannot be kept as large as they are in the Sun, the temperature must be higher. that is an hyperbola on the (n, r) plane. Equation (8.18) still expresses in its extremely simplified form a balance between the source and the sink in equation (8.17): plasma at moderate density may ignite, but only if confined for a sufficient time. In practice, this is a severe constraint; for instance, for n — 1014cm~3 (incidentally, a value typical of charged alpha particles near smoke detectors) the confinement time is about 1 s, still a factor 3 or so longer than ever obtained in any steady-state fusion device tested so far. The consequence of Lawson's criterion has been to focus fusion research on fuels and kinetics characterized by a low ignition temperature, even though their energy yield might be lower. After ignition, hot fuel must be added to maintain steady-state fusion. This process may be steady-state or unsteady (pulsed, for instance). The fraction of energy released by fusion relative to that to heat the fuel is the "gain", Q. This is an important number, telling the overall efficiency of the fusion energy process. A second critical issue in picking a suitable fusion kinetics, see also [Santarius and Logan, 1998], is the type of product particles. Figure 8.8 indicates many fuel kinetics release neutrons of very high energy. Stopping neutrons is difficult, see Section 7.4.1, since they are not charged. Because of this property, neutrons damage organic and inorganic matter. There is a trade-off between ignition quality and neutronics in choosing fusion kinetics. For instance, reaction 2 in Figure 8.8 is the easiest to ignite at its nominal 50 MK (million kelvins); but this number depends actually on the spatial temperature profile and on heat lost via conduction, so it can be higher. In any case, reaction 2 is also very "dirty", in the sense that neutrons of 14.1 MeV are released. In fact, neutron energy constitutes 80% of the total energy released by this particular fusion kinetics, an extremely high percentage. Recovering neutron energy by thermalizing them is critical again because neutrons interact very little with matter. The standard recovery strategy consists of using high-energy neutrons to breed tritium fuel from the lithium blanket surrounding a fusion reactor and working as coolant. Inspection of Figure 8.8 suggests one of the best kinetics is 1a: it needs only D (not T), a fuel that can be extracted from seawater for about $1,000/kg. D abundance in seawater is estimated at 1013ton. However, reaction 1a has a low energy yield, and its ignition at 300 MK is much harder than for reaction 2. In reality, when fusing D with D, all three reactions 1a, 1b and 2 take place simultaneously: their combined kinetics is convenient, because of the "low" ignition temperature and because of high overall energy yield, but produces unfortunately fast neutrons. All tritium reactions have a drawback: tritium does not exist naturally and must be "fabricated" by nuclear processes such as reactions 10 and 11. Neutron fluxes must be of order 1014/cm2s [Metz, 1976] to speed reactions 10 and 11. In practice this means surrounding the fusion chamber with a lithium coolant blanket. Breeding tritium may be accomplished also by fission, as in combined fusion-fission cycles. Likewise, reactions with 3He need this rare isotope (naturally available He is 4He, already scarce and expensive). 3He could be mined on the lunar surface where it is produced by the solar wind. Its lunar soil abundance has been estimated [Wittenberg et al., 1986] at 109 kg. Were 3He to become available at a reasonable price, reaction 3 would be very attractive because of its energy yield, even though its ignition temperature is high. In fact, recent calculations [Shmatov, 2006] indicate that, contrary to what was assumed in the past, fusing efficiencies of the order of 20% are already feasible with D +3 He if they can be compressed to a density of the order of 300g/cm3. This sounds like a "large" density, but it can be obtained with microexplosions (see Section 8.11). The most attractive "clean" or "aneutronic" kinetics is that of reaction 9 between a proton and a boron isotope, since it produces only high-energy helium and no other "difficult" particles; however, its ignition temperature is theoretically infinite because of bremsstrahlung losses: its practical implementation (for instance, heating differently the two reactants) looks far into the future. This said, given certain reactants does not necessarily mean one can impose or control a desirable kinetics, just as it happens in combustion chemistry. For instance, when injecting D and 3He for reaction 3, reactions 1 and 2 would also take place, with rates and final products determined by their respective collision cross-sections (in combustion one would say, "their respective reaction paths''). This means that neutrons would also be produced, indirectly, by reactants of 3. Only reaction 9 would be truly neutron-free (aneutronic), but until realized in practice, radioactivity, albeit milder than in fission, will remain an important fusion issue.